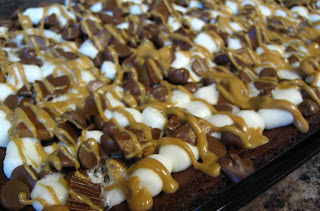 I saw these brownies on Picky Palate and they were fantastic! I took them to a church dinner, and they were gone before I even blinked. I had to cut them while they were still warm because I didn’t make them far enough ahead, so they didn’t cut very easily or cleanly, but they were still fabulous. I think next time I’ll cut the cheesecake part in half, it was a bit too much cheesecake and not enough brownie for me. Either way, these were really good! 1. Preheat oven to 350. Place brownie mix and ingredients on back of box(eggs, oil, water) into a large mixing bowl. Mix until combined and pour into a greased 9×13 inch baking dish. In a separate bowl mix together the cream cheese, peanut butter, sugar, egg and vanilla until smooth. Drop by tablespoonfuls evenly over the brownie batter. Use a knife or toothpick to swirl the cheese mixture through the brownie batter. Bake for 30-32 minutes or until cooked through. 2. 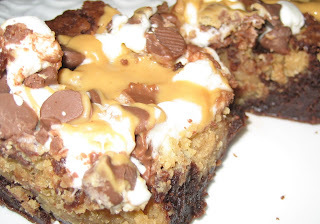 About 2 minutes before brownies are done, sprinkle marshmallows, Reese’s cups and chocolate chips over brownies. Bake another 2-3 minutes or until marshmallows are puffed slightly. While brownies are cooling, drizzle with melted peanut butter. Cool completely. Use a plastic knife to cut into squares. *I only had 5 peanut butter cups, but it would have been better with the full amount. 1 cup of chocolate chips was to much for me, so I would reduce that next time, along with halving the cheesecake part.